In Toastmasters we have values that guide us as an organization. It is our core values that make Toastmasters a successful organization that you can be proud to be part of. 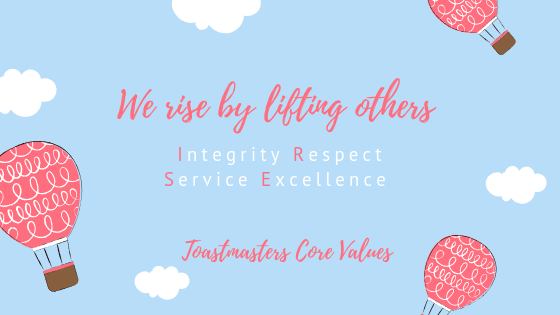 Integrity, Respect, Service and Excellence are the core values of Toastmasters. When we apply the core values of Toastmasters, our willpower will rise. Your club will rise and your Area will rise and your Division will rise. We all will rise together because our core values are in alignment with what great leaders do! Keep the Promise was this years focus from our District Director, Marcia Wood. A Huge part of having integrity in Toastmasters is doing what you say you will do. You said you will keep the Toastmaster promise when you joined. You said you would fulfill your role as Officer when you took Club or District Office. You said you would uphold these values I am speaking of today. The last definition I found states integrity is also completeness or undivided. Does your club have Integrity? Does the District have Integrity? Are you undivided? A second part is how we act, what we do and what we say and how we speak to others. Are you speaking in kindness? Are you thinking about another’s feelings? Are you being considerate? In all organizations it slowly becomes like family. Sometimes there is family or people you may not like, but it is important to still be respectful to them. In Toastmasters, this is even more truthful. It is the regard for the feelings, wishes, rights, or traditions of others. It is talking or emailing someone without personal attacks. It is giving consideration to their role, while working on your own instead of doing their role for them. It is allowing them to do their role or task when you have delegated it to them and not take over and do it for them. 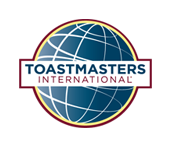 Toastmasters is a voluntary service organization. We devote what time we can, we offer up our time as service, we give of ourselves. We also are accountable for ourselves, our clubs, our areas, our divisions, our district and so on. Headquarters can offer us guidance and assistance but they cannot step in where they don’t belong. We have to be strong enough in our values and integrity to uphold them. Serving when asked or when accepted is up to us. I also say “Fabulous” instead of Excellence, but really we are talking about the same thing. How can you show excellence? Do you WOW your guests when they visit your club? Does your area WOW others with their achievements and accomplishments? Does your District WOW others with how great they are? If you were unsure or answered no to any of these, how can you change that? Can someone else help you who might be able to offer assistance? 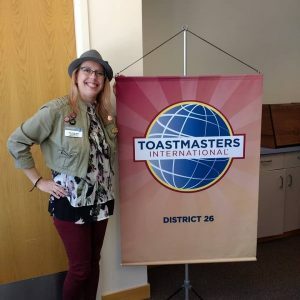 Reach out to those who have the knowledge, training, expertise and experience to help you to be the most “excellent” club or most “excellent” are or division or even the most “excellent” district! Bringing it back around, remember where I started this blog. We rise by lifting others. Are you lifting others up or tearing other down? Even if you don’t mean to, it could be happening. When others come to you with a concern or issue do you attack them or do you come from a place of integrity with who you are and offer them kindness, appreciation, and sincere listening to hear what they are trying to tell you not what you want to hear? What are you doing to lift others? How are you lifting your members up or your leaders up? Who are you lifting them up to? Are you telling them? Are you showing these values to them? Are you adhering to these values yourself? Are your leaders adhering to these values? If not, a suggestion from my mindfulness certification is to follow this guide called RAIN. Recognize, Acknowledge, Investigate, Non-Identify.